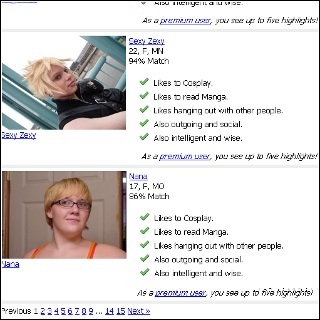 Profiles let you share information about yourself, and act as your hub to MaiOtaku and anime dating. Your profile lists your friends, shows off your pictures, and takes comments from other Otaku. Create Photo Galleries - You can create extra photo galleries to separate your pictures, letting you collect convention pictures in one, personal pictures in one more, while posting your own photography in another. Make Friends - You can make limitless friends on MaiOtaku. Comments - The easiest way to get to know people is by commenting on their profiles. 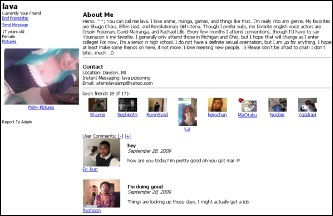 Many users are actively communicating with their friends via profile comments. Send private messaging back and forth with other single Otaku, even easier than commenting on their profiles. Messages show up well organized and easy to read. Threaded Messaging - Messages as part of the same conversation show up in a thread, letting you keep track of the dialogue with ease. Fast Rendering - Our messaging extensively uses the latest AJAX technology to make sending, reading, and even deleting messages easy and quick. 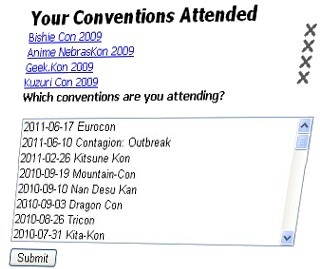 You can tell us the conventions you plan on attending and we'll start matching you with other single anime fans going to these cons. Go To Cons Together - We'll match you to single Otaku who are attending the same conventions, and you can communicate with them to see if you might want to hang together. Past Friends - Meet old friends from anime conventions, and get reconnected with some of your favorite people! Get matched to other anime singles that share your interests. Our matching profile asks questions about your favorite anime types, and more. We match you based on other member's compatibility with your answers. Matching Highlights - Most websites just give you a matching score and expect you to trust it. We highlight some of the traits you share with your matches, making it even easier to know how compatible you are. Location Oriented - Your matches are also weighted by a distance factor, so matches closer to you will appear first. Our learning algorithm ensures the more members we gain the closer your matches will be. 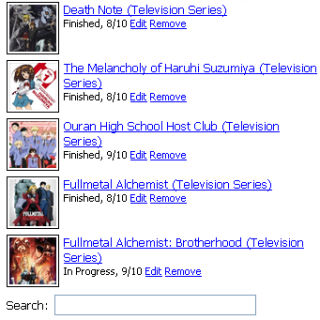 Track Titles - Keep tabs on the anime you've seen or the manga you've read. Rating System - Give input on your favorite anime or manga with our rating system. Where To Watch - Gets links to DVD retailers or to legal internet streaming websites.